**POST Wrestling Live in New York is official for Sunday, April 7th at the Broadway Comedy Club in New York City over WrestleMania weekend. Wai Ting and I will be hosting a live Q&A show at Noon Eastern with a meet-and-greet to follow at 1:30 pm. Tickets are available now for $25 (or $20 if you are a member of the POST Wrestling Café) and are available at http://www.POSTwrestling.com/live. **Braden Herrington and Davie Portman are back with a new edition of upNXT that is on the site covering this week’s hangover edition of NXT following TakeOver. They also share their thoughts on the Royal Rumble, talent moves, and taking your feedback. **Wai Ting and I will have a new Rewind-A-Wai coming out Friday with a review of WWF No Way Out 2000 featuring Triple H vs. Cactus Jack in a Hell in a Cell match. This was chosen by Espresso Executive Producer Ryan Charkow, who will also stop by. This was a fun show with highlights of what was going on in the wrestling that week in 2000, the five-question gauntlet challenge and a big breakdown of this event. We will also have a Patreon show Sunday afternoon reviewing both New Beginning cards this weekend from Sapporo. **WH Park and I will be releasing POST Puroresu Saturday morning. 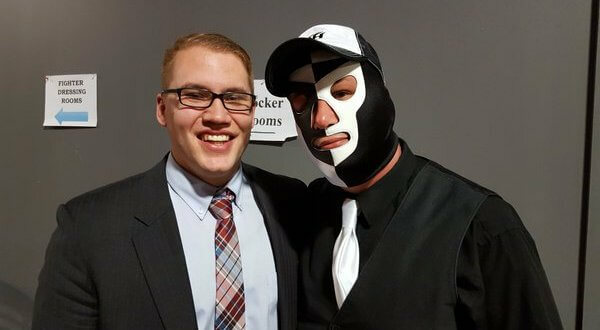 **Ian Riccaboni has signed a new multi-year contract with Ring of Honor to remain as the lead voice of the company. Riccaboni’s deal was coming due April 1st and there was said to be interest from other places, but Ring of Honor made a very good offer for him to stay. Riccaboni started with Ring of Honor in 2015 as the voice for the Women of Honor matches and ascended to take on greater duties, eventually becoming the lead commentator for the promotion in 2017. Riccaboni’s new deal was first reported by Sean Radican at PW Torch and was independently confirmed by POST Wrestling. **Vic Joseph and Shawn Michaels will be calling this Sunday’s Halftime Heat six-man tag that will be taking place live from the WWE Performance Center. **The All Elite Wrestling ticket announcement party will be streaming live on Thursday, February 7th at 9 pm Eastern. Cody, The Young Bucks, Hangman Page, Brandi Rhodes, and SCU will be attendance. They are scheduled to announce the on-sale date for “Double or Nothing” along with new talent and partnerships. **Subpoenas have been filed on behalf of Jerry Lawler’s family against the Hardeman County Sherriff’s Office and the Tennessee Bureau of Investigation as they continue to investigate circumstances behind Brian Lawler’s death last summer. **Impact Wrestling and MLW put out a joint press release on Wednesday to announce their plans to help each other with their WrestleMania weekend cards. Both are running on Thursday, April 4th with MLW at the Melrose Ballroom in New York at 7 pm and Impact running in Rahway, New Jersey that night at 11 pm. Impact was originally partnered with House of Glory for a show in Queens and cited a curfew issue as their reason for moving the show to New Jersey that night, although ticket sales were said to be very slow for the card. Impact is now working with WrestlePro for a live special on Twitch that night. The promotions said there will be no booking conflicts to ensure fans can attend both cards. **Tuesday’s episode of SmackDown Live averaged 2,137,000 viewers on the USA Network following the Royal Rumble. The number was down from the previous two weeks and a disappointment coming off such a major show. Last year’s SmackDown following the Rumble was also down from the previous weeks and averaged 2,509,000 in 2018. **Ring of Honor has announced that The Kingdom will defend the ROH six-man tag titles against Marty Scurll, PCO and Brody King on February 9th in Lakeland, Florida at the next set of television tapings. They have also announced: Jeff Cobb vs. Silas Young for the Television title and a singles match between Zack Sabre Jr. and Rocky Romero for the tapings. The following night they are in Miami for an Honor Club show with the following listed: The Kingdom vs. Jay Lethal, Jonathan Gresham and Rush in a non-title match, Jeff Cobb vs. Rocky Romero for the Television title, Kelly Klein vs. Mayu Iwatani for the Women of Honor title, Zack Sabre Jr., vs Colt Cabana, and PCO vs. Mark Briscoe. **Rey Mysterio visited Eddie Guerrero’s gravesite this past weekend when the WWE was in Phoenix, Arizona for Royal Rumble weekend. Mysterio said it was the first time he visited the site due to the pain and the memories it brought back of the day Eddie passed away in November 2005. **Capitol Wrestling out of New Jersey has announced an international television deal with ZBC in Zimbabwe for their 30-minute weekly show. The promotion has previously announced deals with RNN out of the Northeast U.S, the Fite TV app, and the Global Wrestling Network. **Masashi Takeda is the latest name added to Josh Barnett’s Bloodsport card in Thursday, April 4th. **The WWE stock closed at $82.34 on Thursday. **Bellator sent out a press release with their viewership statistics from their Bellator 214 card last Saturday. Including Paramount Network’s DVR + 3 viewership, the card averaged 784,000 viewers from 9 – 11:44 pm Eastern. The main event between Ryan Bader and Fedor Emelianenko peaked with 1.5 million viewers, while Henry Corrales vs. Aaron Pico and Jake Hager vs. J.W. Kiser attracted 1 million viewers. They added that it was the most streamed preliminary card they have had and the second most-streamed Bellator event ever on the Bellator and Paramount mobile platforms. The viewership figures do not include numbers from DAZN, which simulcasted the event. **Rizin returns with their next event on April 21st in Yokohama at the Yokohama Arena. The card is set to feature former UFC flyweights Kyoji Horiguchi and Ben Nguyen facing off, Muhammad “King Mo” Lawal vs. Jiri Prochazka for the vacant Rizin light heavyweight title, Mikuru Asakura vs. Luiz Gustavo, and Kai Asakura fighting Ulka Sasaki. The card will be streaming on Fite TV. Braden Herrington & Davie Portman chat this week’s WWE NXT including all the fallout from TakeOver: Phoenix, Kairi Sane & Io Shirai vs. Jessamyn Duke & Marina Shafir, The Street Profits vs. The Forgotten Sons, and a bunch of backstage interviews. John Pollock & Wai Ting review episodes of WWE Chronicle on Paige and WWE 24 covering WrestleMania from New Orleans, the latest Being the Elite & Total Bellas, plus Raw is War from Feb. 21, 2000. John Pollock and Wai Ting review WWE SmackDown from Phoenix, Arizona featuring the unveiling of Daniel Bryan’s new environmentally friendly championship. We also discuss WWE’s confirmation of Dean Ambrose’s departure from the company in April. John & Wai discuss Raw after last night’s Royal Rumble with the main matches at WrestleMania 35 taking form, Becky Lynch selects the champion she will challenge, Jeff Jarrett and Road Dogg perform “With My Baby Tonight”, and more. John Pollock & Wai Ting review WWE Royal Rumble 2019 from Chase Field in Phoenix, Arizona. They breakdown the entire card and discuss the winners of the Royal Rumble matches, which matches delivered and which didn’t click, the handling of John Cena’s absence and more. Braden Herrington and Davie Portman have a full review of the NXT TakeOver: Phoenix card going through all the matches, title changes, and future directions. John Pollock and Wai Ting are joined by Aftermath TV co-host and former WWE referee, Jimmy Korderas to preview this weekend’s Royal Rumble. Plus, we take your calls and talk Ronda Rousey’s future with WWE, Abyss & Sonjay Dutt joining WWE, NJPW’s US visa issues, Daniel Bryan goes off on Chase Field, NXT TakeOver: Phoenix, and WWE Worlds Collide. John Pollock and Wai Ting answer their patrons’ questions from the POST Wrestling Forum in the February 2018 edition of Ask-A-Wai. In this 107 min podcast, we discuss AEW, Patreon, UFC, Energy Drinks, ASMR, The Undertaker, Impact and more.